I was craving for stuffed Capsicum/Peppers from past one week. And when I saw the peppers here from Cynthia, I could not resist anymore. So here is my version of stuffed peppers!! 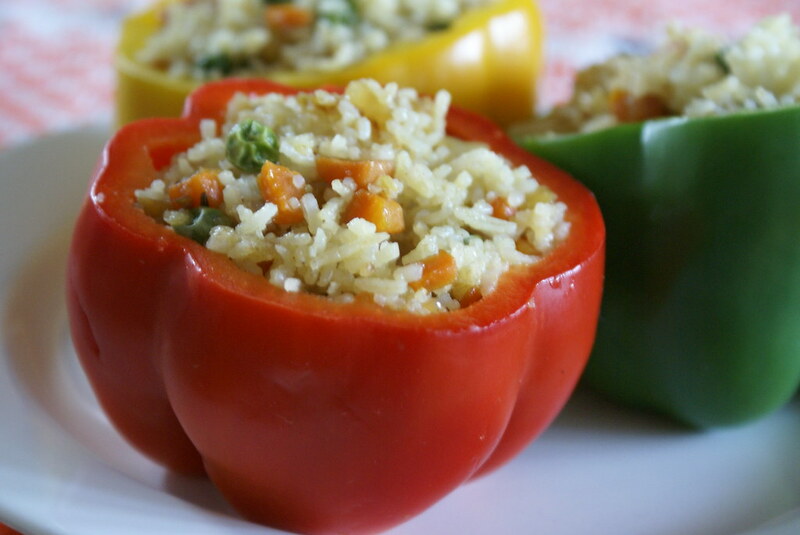 The recipe of Stuffed Peppers varies from person to person. Each one has their own version of stuffing. These brightly colored bell peppers be it red, green or yellow, are rich source of nutrients!! 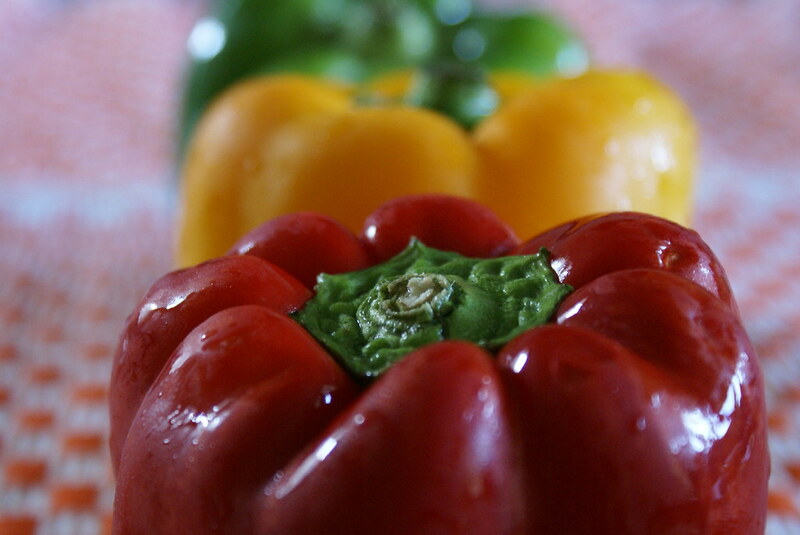 Selecting the Bell Peppers: When selecting, peppers should be well shaped and firm. The skin should be unwrinkled and their stems fresh and green. 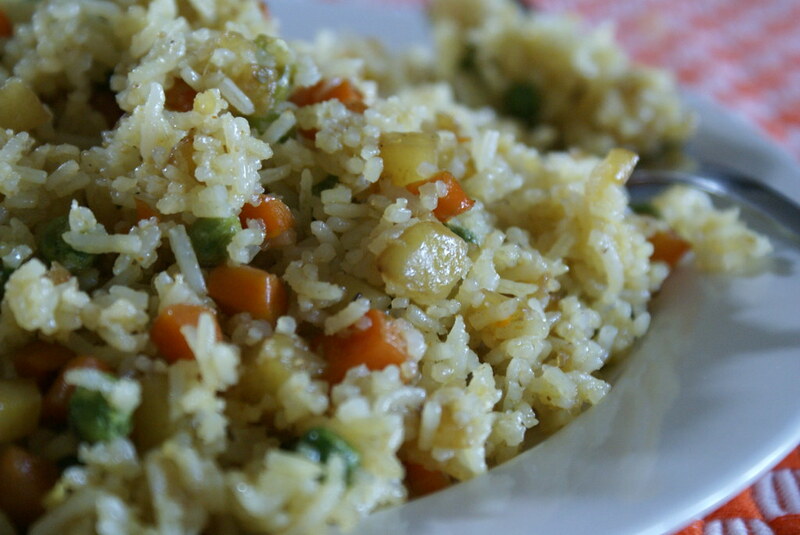 Rice I used for this recipe is the vegetable fried rice, I made for lunch today. You can use your imagination and stuff them with anything of your choice, be it potatoes, ground meat with veggies or rice. Cut the top part of the peppers and remove the seeds inside. Place the peppers in a bowl of water enough to cover them, add salt and boil for 5 minutes. Remove and fill them with the vegetable rice. Cover them with the lids. Brush the peppers with oil, from outside and bake in a preheated oven for 10 minutes. Stuffed with fried rice, yes that would be gooooood. I loved that you used different colour peppers, (I could only find green at the supermarket) Excellent, Cinnamon! 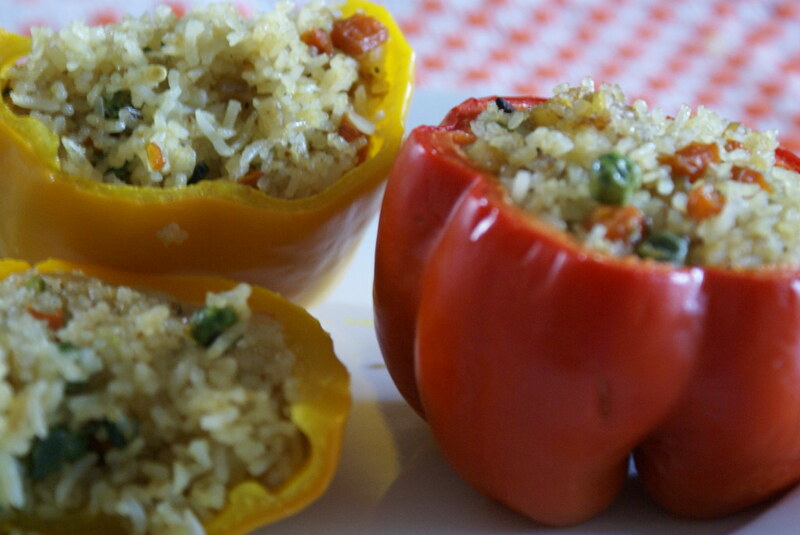 Hi….Thats creative idea of stuffing rice into colourful peppers…wonderful idea…. Wow, those stuffed peppers are awesome dear cinnamon. Excellent job. Thanks for sharing such wonderful and yummy recipe. A feast indeed! Lovely photos! Bhags, Glad you loved the recipe… do tell me how it came out, when u make it! Jyothi, ThankYou, it was my pleasure sharing it! Lovely pics and great recipe! Oh those are looking good. Now I’m craving for them too! r u from hyd and maintaining blog from hyd.i am also from andhra nice to see ur blog.it’s very nice. everything on your blog looks Yum-mmmm-y. thank you for stopping by, i am going have to come back to your often, because your blog and recipes look so inviting. Grrrreat job, I am going to try the peppers! First time here Cinnamon… you have a great blog. These peppers sure are colourful, am sure they tasted good too. Lovely looking peppers. First time to your blog and you have a great collection of recipes here. Hey that looks so lovely and appetizing…As soon as I saw them I am in love with with….Mummmy! even I want one… Nice pictures dear…. good job! lovely presentation , i liked it in Cyn’s blog too. The peppers are looking so nice with the stuffed rice.It is certainly better from the usual potato filling.The red colour of the pepper is looking gr8. Doublespice, Iam sure u r going to love the peppers, try them and let me know!! Sharmi, Thanks and yes Cynthia’s was lovely too! After seeing Cynthia’s post I too got myself a bunch of the smaller bell peppers to stuff! From Hyderabad…so we can look forward to some authentic Hyderabadi food then! You have taken me back years when I used to make a crazy stuffed pepper. I love Andhra food and I see that you are a hyderabadi, so I will keep tuned in for some delicious hyderabadi recipes. hi first time on your blog.the pics are so good… they r tempting. great going… all the recipes look wonderful. Those look soooo good cinnamon, very colorful… a great idea to stuff them with leftover fried rice… Love it! Cinnamon, Those stuffed peppers look out of the world. Beautifully shot pictures all of them. Wonderful idea as well. Akkaa….Why are everyone calling you cinnamon? I reallly loved your stuffed bell peppers. I explained everyone how beautiful they really are. Waiting to try them. Good job sissy. coming to think of it i have never made stuffed bell peppers the same way more than once!! !